﻿Te Roroa has been in discussions with the New Zealand Government for more than ten years regarding the desire to establish a National Kauri Park for the Waipoua. Te Roroa's kaitiaki responsibilities place a high obligation on our iwi to prioritise the health and wellbeing of our forest environment and the people who reside within it. As tangata whenua in the Waipoua our role to greet and manaaki manuhiri into the area is fundamental to our ability to exercise our mana whenua. ﻿With PTA (Kauri Dieback) present in our forest, any new Park would require a considered and careful establishment, with active and informed participation from Te Roroa kaitiaki advocates who are currently working to combat this invasive disease. Te Roroa seeks to establish a centre of research excellence run by Te Roroa within the Park proposal, to ensure our iwi is armed to lead the effort to respond to this threat to our ancient trees. The settlement of the historical Treaty of Waitangi claims for our iwi, and in particular the Tarehu components within the Te Roroa Deed of Settlement and Legislation, has established a solid foundation of partnership with the Crown which Te Roroa would be willing to explore developing into a co-governance arrangement for the Park, similar to those already established with other iwi within Northland and in other parts of New Zealand. Te Roroa reserves its interests in the Wai 1040 claim and Wai 262 Flora and Fauna claim which was reported on in 2011 by the Waitangi Tribunal, Ko Aotearoa Tenei, after more than 20 years of waiting. The recommendations by the Tribunal outline areas of interest that Te Roroa would be keen to address in any Park's proposal. 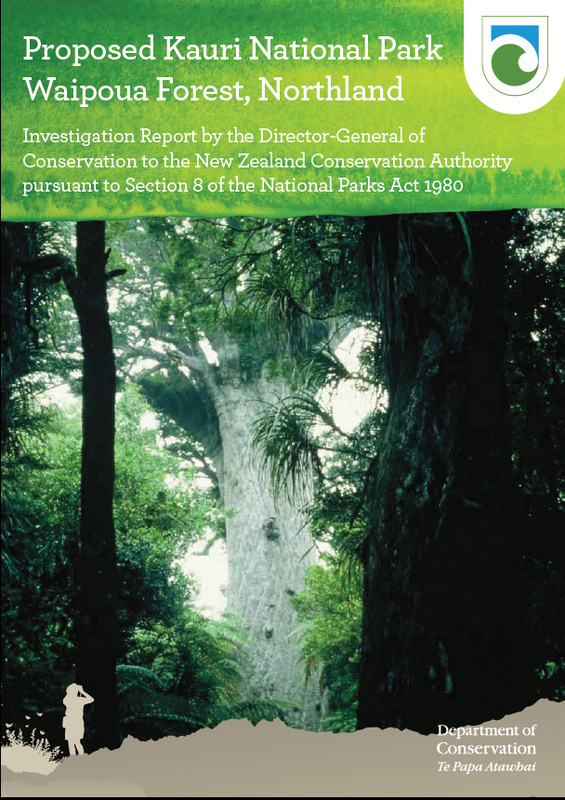 Summaries: Key Themes, Conservation Summary, Taonga Species. As kaitiaki Te Roroa continues its discussion with the Crown and Minister about opportunities to enhance the mauri, tapu and mana of the forest for the benefit of the Waipoua, Te Roroa and for all the people of New Zealand to enjoy. As these discussion progress Te Roroa will work to keep our iwi and the general public informed and involved in the process throughout. Te tangitanga o te kani me te pakotanga o te toki i oe ai te tangata. Giving man reason to yell. Timber! The roaring wind whistles, the land trembles. Alas the burning fire. Ti! Ti! Ti! Where can the little ones run?